Look, I’m not gonna get too fluffy and chest-puffy here. Yes, my goal of finishing a marathon was achieved. However, my finish was not what I was looking for. I completed a marathon, yes, but I didn’t complete it without having to walk at times. I did not complete it without feeling like I may die at times. I did not complete it with a strong upward-sloping momentum as I had envisioned. So in short, I have a marathon under my belt, kinda. I have learned a lot about myself, my new self. The old me would have been complacent and satisfied with a finish, saying, “You did it, buddy. Good job.” The new me’s sentiments are more like, “ok Josh, you got 26.2 under your belt, but you know those results were not good enough. We are a runner now. Merely ‘finishing’ is no longer the goal.” It feels good to look at something that seemed insurmountable three years ago as a somewhat satisfactory, not exemplary, outcome. Things in your mind change when you start addressing the impossible and changing them to the accomplished. My next impossible is a sub-4 hour effort. I am a long way from this goal, but it’s the next hill on the horizon. Speaking of hills, that’s what punched me in the teeth on this marathon. 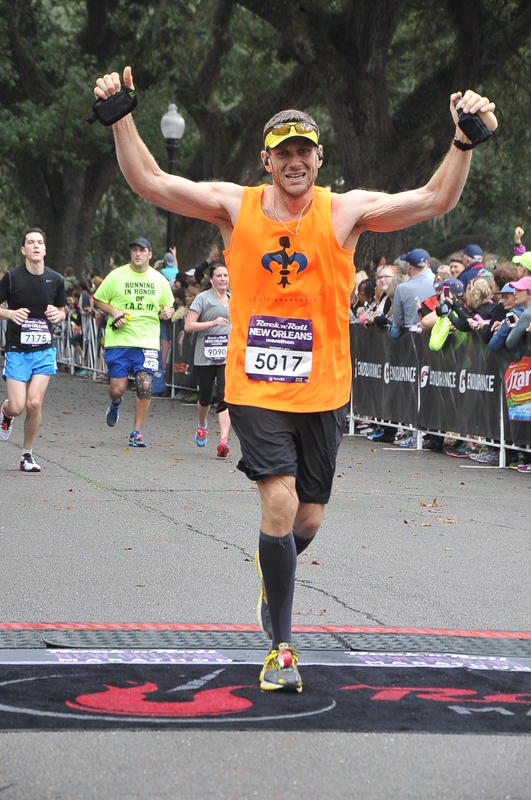 I figured (with no real coach or training, by the way) I should complete the first half of the marathon about 10 minutes slower than the effort I gave at the Louisiana Marathon, which was a 1:58. So, I looked back to my run-tracking app to find my first 1/2 marathon time (3 half-marathons ago). That time was 2:13, and my app said a 9:47 pace (I now know this is off). My logic was based on me comparing a friend’s half-marathon time to his first 1/2 of his last Marathon. The first half of his Marathon effort was 10minutes slower than what his 1/2 marathon time was. So, I aimed to do that too. I aimed even slower, 15 minutes slower than my half-marathon time of 1:58. However, because I had no overall time displayed on my new watch, I was just aiming at finishing the first half at a 9:47 pace, which actually, in retrospect, had me across the first half marker about 7 minutes faster than my plan. So, I had unwittingly pushed too hard in the first half. I felt really good, though. But then came unexpected hills. 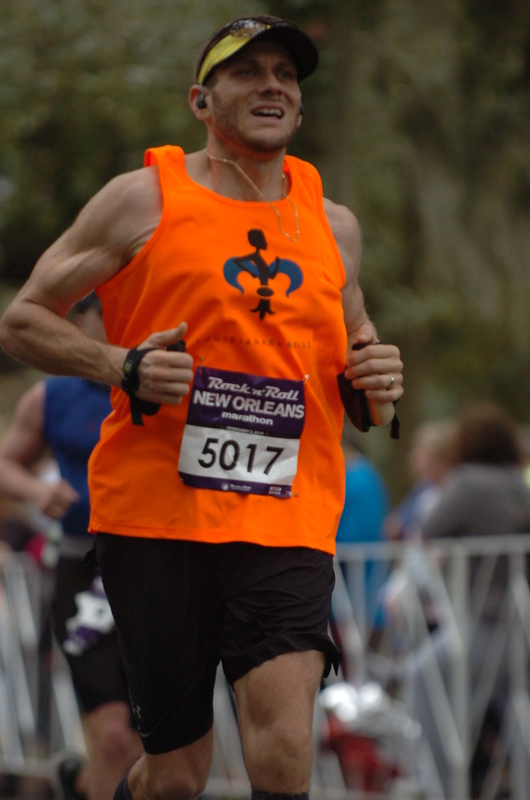 You see, I’ve been running what we call the “city loop” here in NOLA. All my distance runs have been on this route. And in the first half of the marathon we were on portions of this familiar, flat route. I knew the last half of the marathon would be along the lake which is somewhere I hadn’t run before. 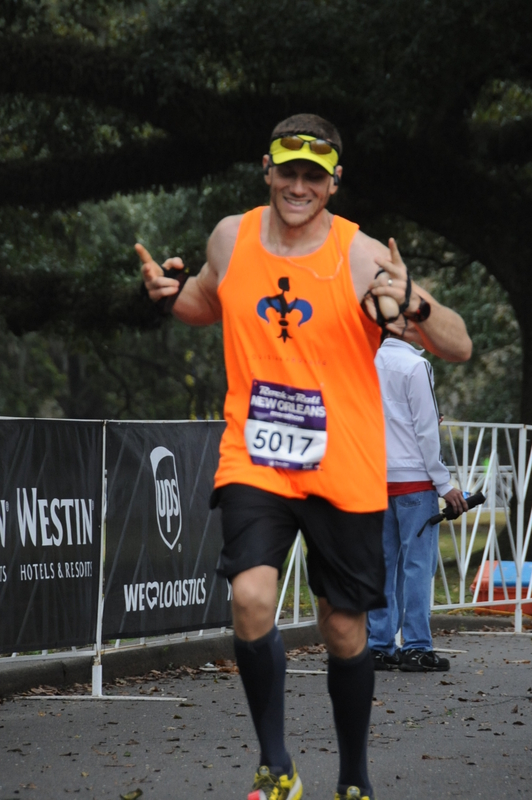 But, because I had run the Half at the Louisiana Marathon in Baton Rouge a few weeks ago, and didn’t have a clue about where I was the whole time (which made the time fly), I figured leaving the second half of this race sort of a mystery would be beneficial. Well, the second half of this race had what was for me significant hillage. I was not ready. And because it was an out-and-back route, as I traversed the hills/bridges the first time, I knew that I’d have to come back over them a second time while even more tired than I already was. I started to get deflated mentally and physically. My pace started to wane. Next thing you know I’m taking walk breaks. Then I’m hearing myself moan and grunt, on the verge of tears. At this point I’m second-guessing everything I’ve done to prepare for this. The other thing I was insufficiently prepared for was the timing of my calorie and electrolyte intake. I really had minimal planning here. I just brought some electrolyte gel, and one pack of Hammer Gel. And I should have been consuming more of this during the first half. This mistake in combination with running too hard and the unexpected hills had me cramping in mile 22. This is where my beautiful, gym-rat-only-runs-because-I-do-and-we-are-a-team wife passed me. I had gone pale. I was queezy. I was cramping. My little world was crumbling. I wasn’t feeling triumphant at all. In mile 24 the 4:30 pace group caught and passed me. “Damn!” I thought. I started to pick it back up. 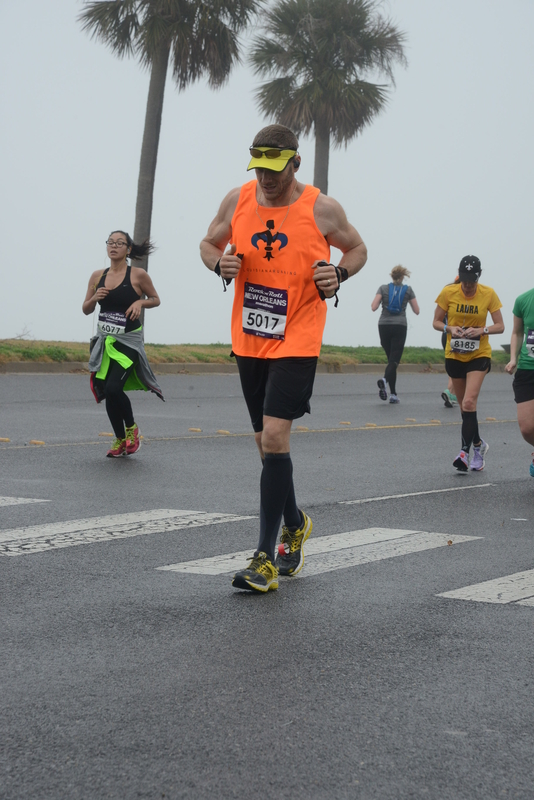 I had gotten a lot of water in me in mile 23, and my cramping seemed to dissipate. I pushed through 24. And in 25 I was smelling the finish, and was able to gut out an eleven minute mile to finish. I nearly broke down at the finish, but I was literally too tired, and probably dehydrated, to cry. My family and friends were there waiting for me which helped my spirits in a profound way. Even with all the mistakes and disappointment, I felt some pride in what I had accomplished. I took a minute to look back from where I had come. And, I looked over at my brother who was still crusty with salt, and proudly wearing his finisher medal having just finished his first half-marathon, 150 lbs lighter than he was just last year. My wife was beaming, and I was so proud of the way she gutted that race out. Our friends and family who made up Team LaJaunie were doting over us; giving us water, fruit, a helping hand off the ground, a folding chair to rest in, a jacket to keep warm in, spirited displays of pride and affection for the runners of the day. Simply amazing. I am humbled by this experience. I am proud of myself for doing something that most people think is “impossible”. But, I am chomping at the bit to get back to making me a better runner. Way to go Josh. 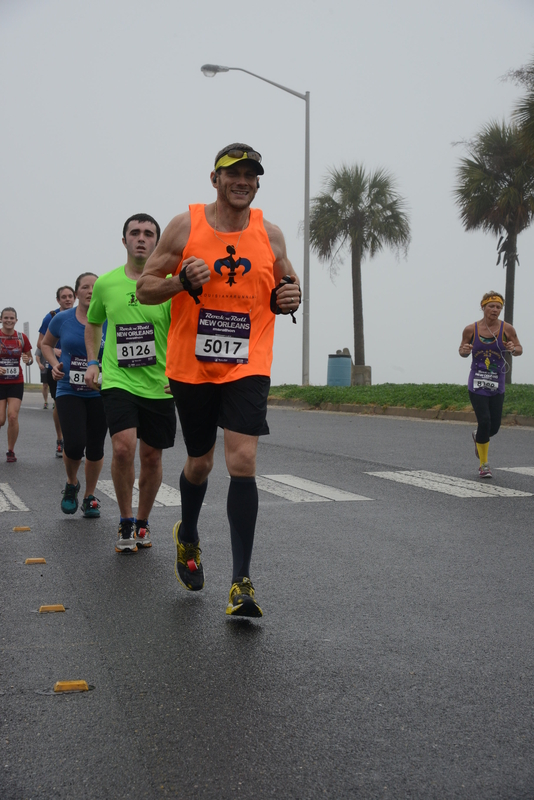 I vividly remember my very first marathon, including the emotion, the pain and the desire to get back out there (eventually) to do even better despite how I was feeling at the time. You have come a long way and I have no doubts you WILL get the marathon finish you dream about but as an outsider, I still think you “won” that race. The influence you have had on not only your family (your brother is really down 150?!!) but also for the people in your town and the hundreds of people you touched through your interview with Rich Roll. You won!! No matter what, you won Josh. Pacing, fueling and negative splits come with practice …. what you have accomplished nationwide is straight from your god given talent as an inspirational human being. Thank you for saying that. I don’t mean to downplay something that was so life changing for me. But I want the next level…then the next. And I want to make sure I exhibit that mindset when talking about my running/fitness/nutrition. Thanks again. That mindset means you have arrived as a runner and an athlete. 🙂 I look forward to more posts. Thanks for sharing your stories. I am inspired. I have friends in Louisianna. They are all amazing cooks. Iam impressed that you eat a healthy plant based diet. My husband and I started in October. In such a short time it just seems normal. Of course many people think we are a little odd. Way to go! Congrats Josh!! I’m just starting to read Matt Frazier’s book to complete a marathon a year from now. Could you please tell me what those things are in your hands. All the best to you. One is an iPhone holder (I use it for music and podcasts via blue headphones), and the other is a bottle electrolyte gel. Congrats on the marathon!! I heard you on the Rich Roll podcast and was super inspired. I’m glad you’re still sharing your story. It’s so awesome to see you continuing to thrive. Love it!! Looking forward to hearing about that Sub-4 marathon! Thank you! Training and Loving it.